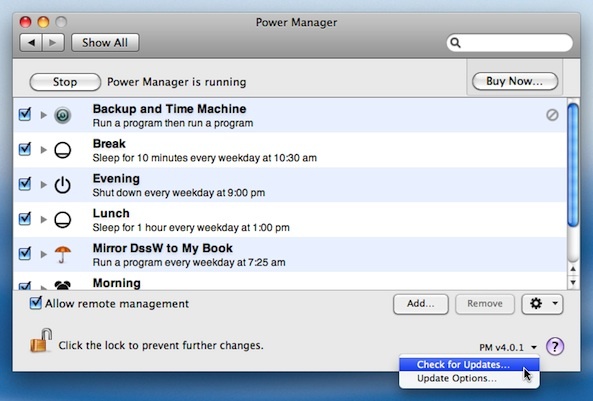 Power Manager 4.0.1 and Power Manager Professional 4.0.1 are now available. These updates fix bugs discovered since launching last month, and include a handful of small refinements. Bug: Fixed bug that could stop licensing Apply button being enabled (Mac OS X 10.4). Refined: Reworded licensing dialogs and removed requirement for organisation value. Refined: Removed edge case where Professional's auto-saving library could present a save dialog (Pro). Refined: Updated removal tool's confirmation dialog. Refined: Added editors for choosing directories, executables, and files (Pro). Thank you to those who reported these bugs. We appreciate your time and effort in finding and isolating these bugs. This article was posted in PM4, PMPRO4, and Power Manager and tagged bug fixes, dssw, Power Manager, Power Manager Professional, refinements, and release.